Axio Zoom.V16 features an impressive sixteen-time zoom factor with a high aperture. 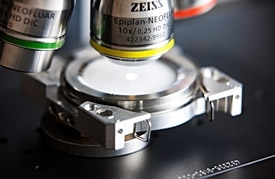 The zoom microscope system captures large measuring surfaces quickly and with high resolution. Through the new motorized intermediate tube for polarization contrast, the particles are classed as reflecting or non-reflecting; in a fully automatic process. The filter analysis with the AxioVision Particle Analyzer software module provides data on the concentration, size distribution and type of the particles. Axio Zoom.V16 provides ideal representations of particles measuring upwards of 5µm and delivers all required information quickly. "The first users at the Fraunhofer Institute for Manufacturing Engineering and Automation IPA in Stuttgart are impressed by the high depth of field and the short analysis time," enthuses Jati Kastanja, Product Manager for Particle Analysis at Carl Zeiss. Correlative microscopy combines light and electron microscopy in one work process. The light microscopy examination provides results on the particle concentration, size distribution and type. In addition, energy-dispersive spectroscopy (EDS) generates data on the chemical element composition – this forms the basis for material classes for pre-selected particles. Three different user modes enable adjustment to the pending tasks and determine the degree of detail of the analysis. The ZEISS electron microscopes EVO and SIGMA as well as the Axio Imager light microscope support correlative particle analysis. The examination is fully automatic and is up to ten times faster than respective individual examinations. At the end of the process, users receive a combined report on the light and electron microscope analysis.